In an eight film box set, even one concerned with the works of one of the great directors, it is understandable that you might find a couple of duds. 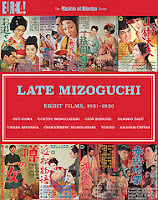 Whilst it means that approaching the final three films of the set will be an enterprise full of concern, it is nevertheless pleasing to find that you have to get to film five in Masters Of Cinema's Kenji Mizoguchi box set before you hit Uwasa No Onna, a decidedly literal tale that proves very lacking in character investment, emotion or subtlety. Another film set in a geisha house, it is difficult for this film to escape the shadow of the wonderful Gion Bayashi, which takes a similar setting and uses it not to tell a trite and predictable story but to use two strong female characters to assess the fiscal position of a country. Meanwhile, in Uwasa No Onna, a heartbroken Yukiko (Yoshiko Kuga) returns from Tokyo in the company of her mother Hatsuko (Kinuyo Tanaka), a geisha house owner, to spend a great deal of time moaning, poach the man (Tomoemon Otani) the mother was after and generally attempt to be as frivolous about love as possible, whilst simultaneously bemoaning how it has treated her and her fellow house residents. It's very difficult to see through Yukiko's melancholy, especially seeing as her heartbreaking and suicide attempt happens entirely off screen, but it is even more difficult to empathise with a film which shoves several of its messages at you with a forcefulness reminiscent of a children's book. Towards the end, Hatsuko addresses part of the film's core message by telling Yukiko (us) that 'you know, in some way, life is all about suffering', a revelation for everyone, I'm sure. 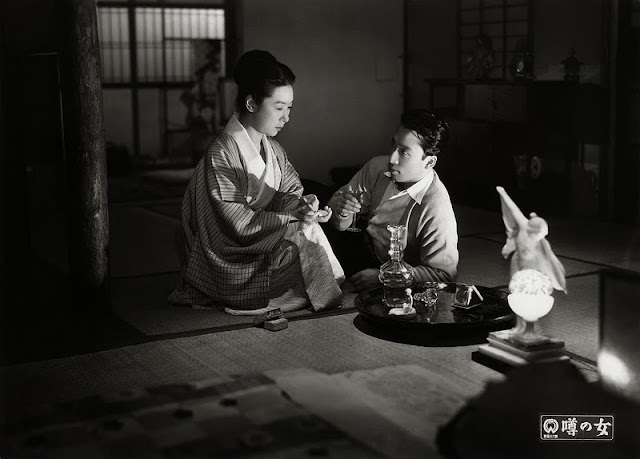 Before that, two crushing metaphors have been delivered by Mizoguchi in the shape of uninteresting stage performances. In the first, Dr. Matoba (Otani) is shown turning his head from the older Hatsuko to the younger 'more attractive' ones on stage, represented with greater clarity and artificiality in his programme (might this mirror the plot? ), whilst the second depicts an older woman in love with a younger man as a figure of some fun and 'hilarity' (might this also mirror the plot?!). The finale echoes a lot of Mizoguchi's work at this point, as he concludes that all men are terrible shits who deserve to be punished by being exorcised from the narrative. In this, and other cases, he happens to be entirely right, but the wrapper around the message has certainly been better, and the ideas realised to a much more fulfilling degree.